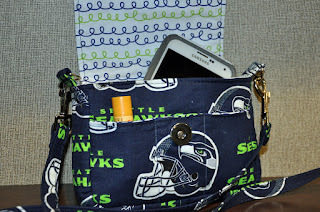 Once again, I was able to be a pattern tester, this time for a great little bag from Stitched Essentials. 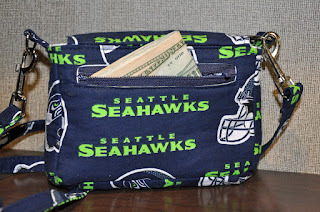 This bag is perfect for those times when you want to go to a game at the stadium or a concert but have to deal with size regulations. Meet Bella! The front flap is kept closed with a magnetic snap fastener. The thin strap can be made to your length preference. Add a 1/2" slide and make it adjustable. Bella's back features a zipped pocket, perfect for keeping your cash and credit cards secure. Inside, there is a pocket large enough to hold your cell phone along with a pack of tissues, your tickets and some other smaller sized items. You'll also find two slip pockets to hold your lip balm and lipstick. Maybe tuck a small pen in there. Be creative! 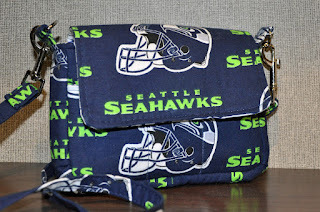 You can purchase your pattern through the Stitched Essentials Etsy shop here and start sewing your own bag immediately! No waiting for the mailman to arrive. It's fast, fun and fabulous! My mother recently pieced a quilt for one of my cousins in Florida. 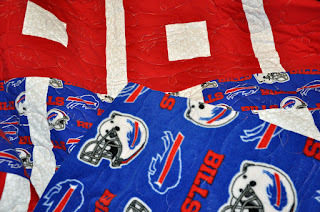 Kris is a big Buffalo Bills fan. 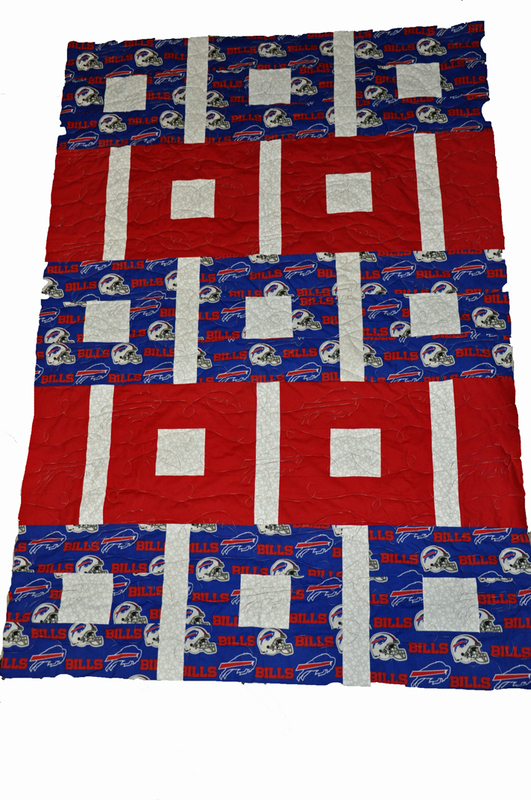 After looking at the quilt, I decided I wanted to do a custom edge-to-edge quilting pattern. 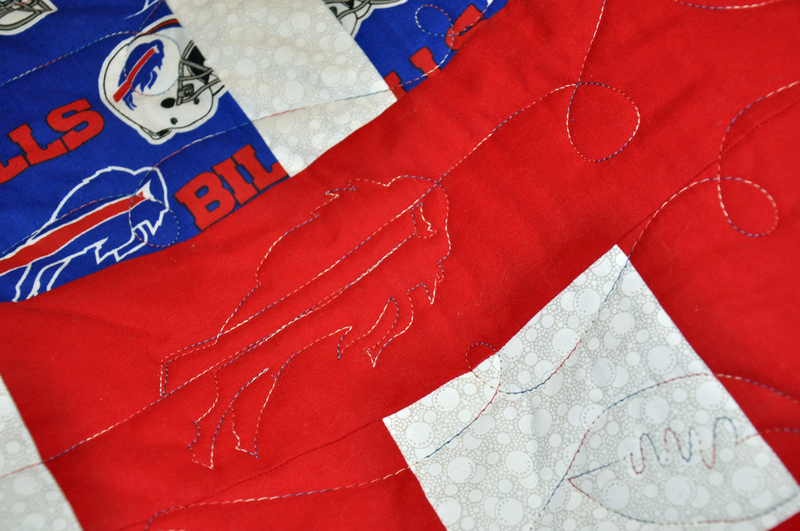 It took me a few tries on paper to get the Bills logo in a continuous stitch line. Finally the quilt was ready to load on the frame and before long, it was finished, ready to ship back to my mother for the binding. 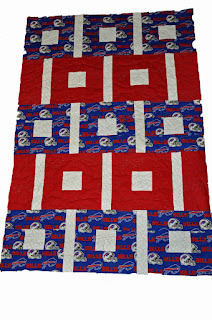 I used Superior's King Tut red/white/blue thread. Mom shipped a matching fleece to use as the backing. I am pleased with the outcome. I hope my cousin enjoys her new quilt!